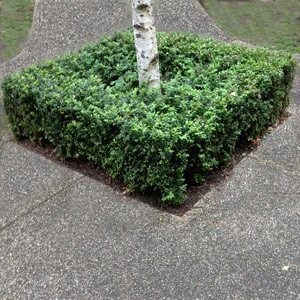 Widely used for low hedges, English Box (Buxus sempervirens) Hedging is slow growing, which makes it well suited to smaller hedges. It is dense growing with small deep green foliage. The small foliage makes pruning easy as the plant looks neat immediately after. The best height for English box is between .5m and 1 metre. It can grow taller however is not as easy and neat at taller heights. This is the hedging plant so widely used in English and French gardens for centuries. It is used in parterre gardens as well as knot gardens as a formal hedge. Today it is used as a low growing formal hedge, for topiary as well as a container plant. For a narrow growing hedge, try the very upright Buxus Graham Blandy. Once established this is a very easy care plant. For a good hedge minimum widths and heights should be observed. Usually 50 cm is a minimum width, and again 50 cm is the minimum height. This height and width allows for adequate growth and easy pruning. When planting, the recommended spacing is 30 cms, and the plants should be set out first. Make sure you choose plants of the same height and with multiple stems. Measure the planting distance and use a string line to keep the plants straight. Use a general purpose slow release fertiliser each spring. You can also mulch each spring and add a little well rotted cow manure. Always water before and after fertilising. This is best carried out regularly. As soon as you have planted, prune all the plants to the same height. Each year in spring, new growth will be a paler green, as it darkens to the deep green of mature foliage it is time to prune. Over time the plants will get larger and eventually join up to form a complete hedge. Spread – Will spread to 1 metres easily pruned. Growth Rate – Slow to Medium .